The recent reboot of necrons has injected some new ideas into the 40k meta, and players are trying out various combos and builds from the new codex. The new rules introduce some new mechanics, and regular reader Rowan Sheridan has asked for some insight into Tesla weapons. A nasty necron immortal is firing his Tesla Carbine at a horde of terrifying Tyranids. As he aims, he gets blasted by Paroxysm making him BS1, how does this affect his odds of getting the bonus Tesla hits? What if his carbine was twin linked due to the Targeting Relay of a Triarch Stalker? A Tesla weapon gets you three hits on a to hit roll of a six, and so we can quickly get an answer for the first element of our discussion. The BS of the firer of a Tesla Carbine is irrelevant for the purposes of the bonus hits, you always have a one in six (16.67%) chance of rolling a six. Obviously with higher BS you’ll miss less and will therefore always come out better on average in terms of regular hits (just not in terms of bonus hits). Now as interesting as this may be, we can’t ignore the fact that at BS1 he’s simply going to miss more often – is the additional probability of the Tesla bonus good enough to mitigate his lousy aim? How about a graph of the total number of hits (regular + bonus) we would expect (on average) per hit roll made? 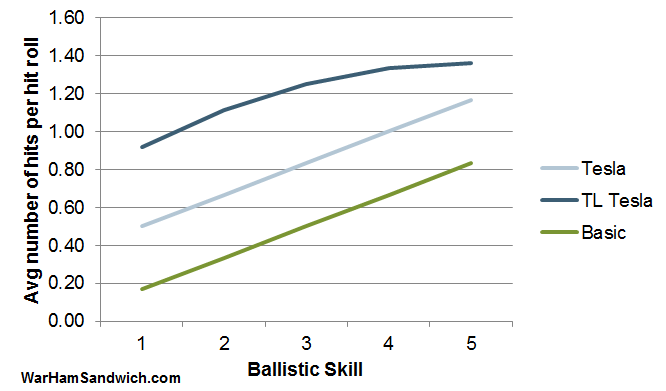 The graph shows the expected number of hits for BS values from 1 to 5 for a ‘Basic’ (i.e. non Twin Linked, non Tesla) weapon, a Tesla weapon, and a Twin Linked (TL) Tesla weapon. As you can see for increasing BS you expect more hits, so the Tesla game mechanic hasn’t done anything too strange. In non twin linked Tesla the bonus improves all BS equally, and for twin linked it improves weak BS more noticeably. If GW had set the Tesla bonus hits at higher level then you really would start to get strange effects. Non-twin linked Tesla would almost negate any difference between BS values, and for Twin linked Tesla low BS could be for better than high! Thankfully that’s not the case. That’s all a bit theoretical, but Rowan’s actual question was more specific to the Tesla Destructor, which is four twin linked shots of tesla. If you recall my article on 2d6 we saw a spike on the 7 result because the largest number of possible combinations added up to 7. 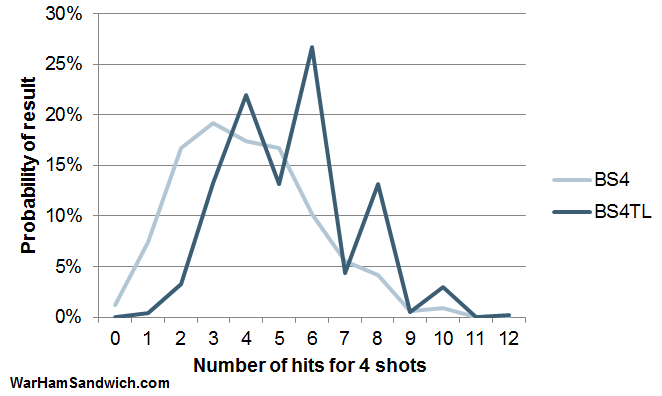 We see a similar but more complex action here where certain results peak as there are more ways for that exact number of hits to occur (as an interesting quirk, it’s impossible for the 4 shots to produce a result of 11 hits). The key difference between the TL and non TL results is that TL gets better odds of the bonus hits and so the combinations that need those ‘3s’ get amplified (and the improved hit rate that makes TL generally useful also shifts the curve to the right). Interesting graph, but how about I boil it down to a straight comparison? And if you think that’s good – I haven’t included Arcing in this analysis! This entry was posted on Sunday, January 8th, 2012 at 3:05 am	and tagged with 40k, necron, probability, tesla, twin linked and posted in Probability. You can follow any responses to this entry through the RSS 2.0 feed.